1 Programa de Pós-Graduacáo em Ciencias Médicas, Universidade Federal Fluminense, 24030-210, Niterói, RJ, Brazil, 2a Departamento de Biofísica e Biometria, 2b Departamento de Histologia e Embriologia, 2c Departamento de Biologia Celular e Genética, Instituto de Biologia Roberto de Alcántara Gomes, Universidade do Estado do Rio de Janeiro, 20551-130, Rio de Janeiro, RJ, Brazil,3 Coordenadoria de Pesquisa, Instituto Nacional do Cáncer, Rio de Janeiro, RJ, Brazil. The radiobiocomplexes labeled with technetium-99m (Tc-99m) have been widely used in nuclear medicine in single photon emission computed tomography and in basic research. The aim of this study was to assess the influence of a Nectandra membranácea extract on the bioavailability of the sodium pertechnetate (Na99mTc04) radiobiocomplex in rat organs. The animals were treated with a N. membranácea extract (30 mg/ ml), for 6 days. Na99mTc04 was injected, the organs were isolated and weighed, and the radioactivity was determined in each organ (%ATI/organ). The %ATI/organ was divided by the mass of each organ to calculate the %ATI/g. A significant increase of the %ATI/organ of Na99mTc04 was observed in muscle and thyroid as well as in the %ATI/g in the heart, kidney and thyroid. These findings could result from the interaction between components of the plant extract and the radiobiocomplex which may influence the uptake Na99mTc04 in rat organs. Therefore, precaution is suggested in the interpretation of nuclear medicine results in patients using this herb. Key terms: Nectandra membranácea, bioavailability, sodium pertechnetate, radiobiocomplex. Nectandra membranácea, which receives the popular name of white cinnamon, is a lauraceous plant from South America. Plants from this genus have been used in the treatment of several clinical disorders in humans (Silva-Filho, 2004). It has been demonstrated that Nectandra plants have potential analgesic, antiinflammatory, febrifuge, energetic and hypotensive activities and are commonly used as berberine sulphate (Le Quesne et al., 1980, Silva-Filho, 2004). Nectandra also has been investigated as a possible antitumoral agent and the presence of neolignans was suggested as potential chemotherapeutics (Silva-Filho, 2004). Crude extracts of Nectandra contain alkaloids and lignans such as nectandrin A and nectandrin B as well as tannin, berberine and sipirine (Le Quesne et al., 1980). Some authors have postulated that tannins play important roles as antioxidant compounds in the scavenging of free radicals (Fenglin et al., 2004). Slish et al. (1999) reported that an extract of N. salicifolia has potent relaxant activity on vascular smooth muscle (Slish et al. 1999). Researchers of the entire world agree that pre-clinical large studies on herbal medicine are important and urgent, specially high-quality clinical and pre-clinical trials (Rotblat et al., 2002). Radiopharmaceuticals, recently called radiobiocomplexes (Moreno et al., 2005), are radioactive tracers used in nuclear medicine useful to study morphological and physiological changes in blood flow, absorption and metabolism in target organs (Chandra, 1998; Gomes et al., 2002). The incorporation of a radionuclide into a drug formulation allows to determine the bioavailability and the release sites of a drug (Hladik III et al., 1987; Early and Sodee, 1996). Technetium-99m (Tc-99m) has been widely used to label various radiobiocomplexes used in nuclear medicine mainly in single photon emission computed tomography (SPECT). Tc-99m presents optimal physical characteristics since its half-life and photonic energy allow to obtain images with high efficiency using low doses (Hladik III et al., 1987; Early and Sodee, 1996). Radiobiocomplexes as sodium pertechnetate (Na99mTc04) are tracers widely utilized for scintigraphic studies mainly for thyroid, brain and stomach. Na99mTc04 has also been used to label blood constituents (Hladik III et al, 1987; Early and Sodee, 1996; Moreno et al., 2004; Saha, 2004). Studies have demonstrated that many natural and synthetic products may affect the bioavailability of radiobiocomplexes (Diré et al., 2003; Gomes et al., 2002, Capriles et al., 2002; Moreno et al., 2005, Jankovic and Djokic, 2005). It has been observed with eggplant, chayotte and Ginkgo biloba extracts (Diré et al., 2003; Capriles et al., 2002; Moreno et al., 2005). Considering that the underlying action mechanisms of several plants extracts remain unknown and that there are persons using N. membranácea that may need a nuclear medicine procedure, we decided to evaluate the effect of a N. membranácea extract on the bioavailability of the Na99mTc04 radiobiocomplex using rats as experimental model. Plants were collected in the Macico of Pedra Branca Natural Reserve, in Rio de Janeiro, State of Rio de Janeiro, Brazil, in July 2005. They were identified by Professor Rogério Oliveira (Botanist) and deposited at the Herbarium Alberto Castellanos (Fundacáo Estadual de Engenharia do Meio Ambiente -FEEMA), in Rio de Janeiro, Brazil, under the number 85743-8. N. membranácea leaves (1300g) were submitted to percolation using 5000 ml of cold ethanol (95%). The solvent was evaporated in a rotative evaporator with reduced pressure and a dried fraction of the N. membranácea leaves was obtained (85g). This dried fraction (300mg), was almost totally homogenized with 10 ml of NaCl 0.9% with vigorous shaking in a Vortex for 20 seconds. This preparation (30mg/ml) was centrifuged at 1500 rpm for 5 minutes and the supernatant (aqueous solution) was considered as 100%. Female Wistar rats (180-220 g) were obtained from the Laboratorio de Radiofarmácia Experimental (Departamento de Biofísica e Biometria, Universidade do Estado do Rio de Janeiro, UERJ, RJ, Brazil). The animals were used after an acclimatization period of 7 days and the experiments were conducted in accordance with the Department Committee of Animal Care of the Institution. The animals (treated and control) were maintained under controlled room conditions corresponding to 22±5° C, 12 h of light/dark cycle with water and a normal diet ad libitum during the experimental period. One mililiter of the N. membranácea aqueous extract (30 mg/ml) was administered to Wistar rats (n=5) by intragastric via, once a day, during 6 days. The control group received NaCl 0.9 %. The radiobiocomplex Na99mTc04 (0.3 mL, 3.7MBq) was obtained from Instituto de Pesquisas Energéticas e Nucleares, Comissáo Nacional de Energia Nuclear, Sao Paulo, Brazil and was injected in the ocular plexus. The animals were sacrificed 10 minutes after the treatment with the radiobiocomplex. The organs (brain, liver, duodenum, heart, kidney, spleen, stomach, pancreas, ovary, blood, bone, lung, muscle and thyroid) were isolated and weighed in a clinical balance. The organs were put in glass tubes and the radioactivity was determined in a well counter using an Automatic Gamma Counter (Packard, USA). The percentage of radioactivity per organ (%ATI/organ) was determined dividing the activity in each organ by the total activity administered to the animals. The percentage of radioactivity per gram of tissue (%ATI/g) was calculated dividing the % ATI/organ by the mass of each organ. The Student's t-test was used for statistical analysis and p<0.05 was considered to indicate statistical significance of the difference between experimental and control groups. 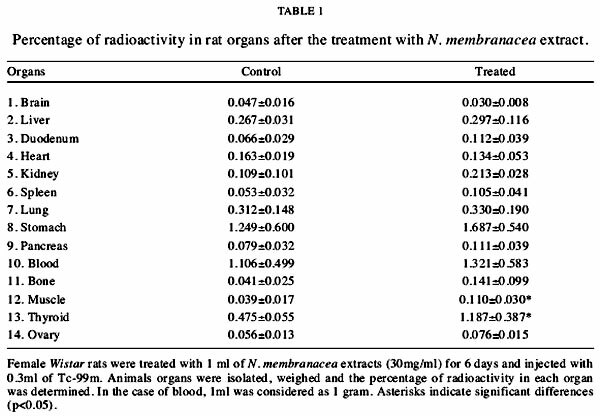 The results in table 1 show the relationship between the percentage of radioactivity per organ (%ATI/organ) of the radiobiocomplex Na99mTc04 in the experimental group treated with N. membranácea extract and the control group. Results indicate a significant increase in the uptake of the Na99mTc04 in thyroid, from 0.475±0.050 (control) to 1.187±0.387 (treated, p=0.010), and in muscle from 0.039±0.017 (control) to 0.110±0.030 (treated, p=0.004) (p<0.05). No significant changes in the uptake of this radiobiocomplex in the brain, liver, duodenum, heart, kidney, spleen, stomach, pancreas, lung, ovary, blood and bone (%ATI/organ) were found. 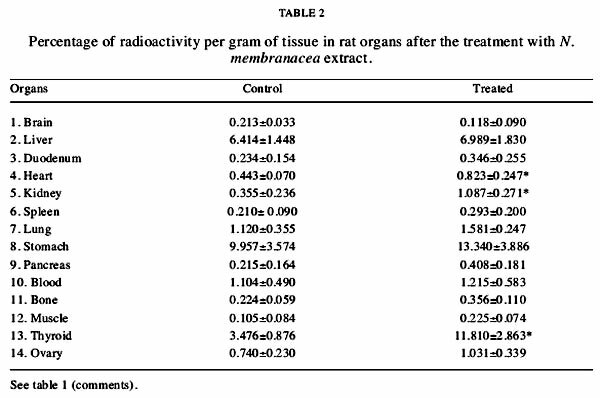 Table 2 shows the percentage of radioactivity per gram of tissue (%ATI/g) of the radiobiocomplex Na99mTc04 in the treated animals with N. membranácea extract and in the control group. Significant increases in the uptake of the Na99mTc04 in the heart, from 0.440±0.070 (control) to 0.823±0.240 (treated, p=0.023), in the kidney from 0.355±0.236 (control) to 1.087±0.270 (treated, p=0.006), and in the thyroid from 3.476±0.876 (control) to 11.810+2.863 (treated, p=0.001) were observed. This study intends to contribute on the possible effects of natural products on radiobiocomplex absorption in animals. Consequently, a dependable use of these products by the population would be possible. Moreover, the development of experimental models allowing to identify biological properties of natural products extracts is highly desired (Rotblatt et al, 2002). Some authors have described effects of natural and synthetic products on the bioavailability of radiobiocomplexes using animal models (Capriles et al., 2002; Diré et al., 2003; Moreno et al., 2005; Santos-Filho and Bernardo-Filho, 2005). Several studies have been performed to analyze the action of substances on the bioavailability of the radiobiocomplex Na99mTc04. Capriles et al. (2002) and Diré et al. (2003) demonstrated that natural products, such as, eggplant and chayotte extracts, respectively, are able to promote changes on the bioavailability of the Na99mTc04. Santos-Filho and Bernardo-Filho (2005) have observed that Hypericum perforatum extract decreases the bioavailability of the Na99mTc04 in the bone, muscle and thyroid (Santos-Filho and Bernardo-Filho, 2005). Moreno et al. (2005) have reported that Ginkgo biloba extract altered the uptake of Na99mTc04 in several organs, such as kidney, liver and duodenum. Results obtained by other authors and those of the present study indicate that the interaction herb extract-radiobiocomplex depends on the phytocomplex used, on the experimental conditions utilized and on the radiobiocomplex selected for the study. The treatment with N. membranácea extract increased the uptake of Na99mTc04 by muscle and thyroid (%ATI/organ) and by heart, kidney and thyroid (%ATI/gram of tissue). It is possible to suggest that these findings would be relevant to: (i) increase information about the possible interaction of this plant extract with pharmaceuticals, (ii) develop an experimental model to study the interaction betwen an herb extract and a radiobiocomplex. These data suggest that the metabolization of the N. membranácea extract in rats could generate active metabolites able to influence the bioavailability of Na99mTc04 radiobiocomplex. This radiobiocomplex has been used to evaluate some functions of the brain, thyroid gland, stomach and heart. Some of these findings could be due to a possible relaxant action in the vascular smooth muscle, as described by Slish et al (1999) for N. salicifolia extract. In conclusion, this work showed an alteration in the radioactivity uptake in heart, thyroid, kidney and muscle due to the treatment with N. membranácea extract. Therefore, precaution is suggested in the interpretation of nuclear medicine results when patients are using this herb. Moreover, in order to evaluate the behavior of the N. membranácea extract and consequently the mechanism of action of this phytocomplex in the uptake of sodium pertechenetate by organs, other experiments with scavengers of free radicals are being carried out. The present work was carried out with support of the CAPES, Institution of the Brazilian Government for development of human resources. We are also indebted to FAPERJ, CNPq, UERJ, UFRRJ and UFF. Received: February 27, 2006. In revised form: August 7, 200. Accepted: November 6, 2006.